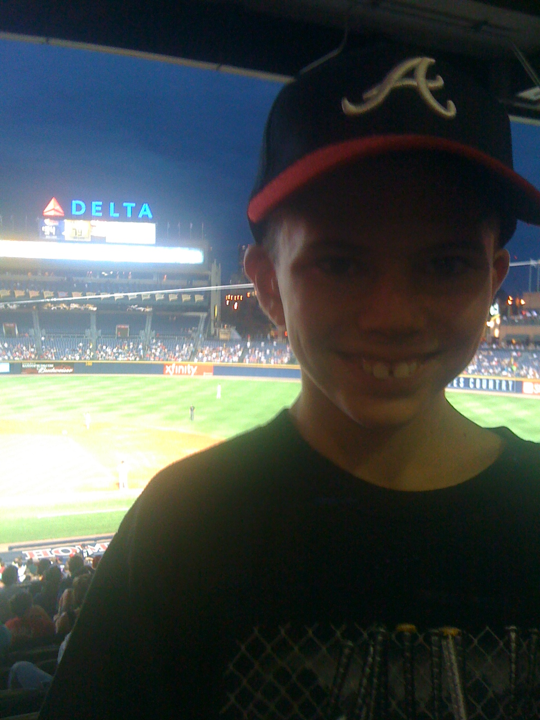 During the summer I took Jackson (my 9 year old son) to a Braves game. He is beginning to really enjoy the game so we try and go to a game at least once a year. This year he wanted a new Braves hat to wear to the game. I convinced him to wait until the day of the game and we could buy one from a vendor and get a better deal. He had money in his pocket and it was burning a hole. He begrudgingly agreed to wait over a month to buy his hat. An integral part of this story is that Jackson has finally begun to understand that work can yield good money. I felt like it was time for Jackson to learn how to mow grass. You can read all about the grass mowing experience here http://wp.me/pPMNN-3X. Now back to the hat. We had been looking forward to the game for over a month. I had the entire day blocked out so we could leave early and get to the stadium in time for him to buy his hat and not be rushed. Some of you may have had “the pleasure” of shopping with Jackson but most probably have not. Let me clue you in that Jackson is VERY methodical in his selection process. He does not do this process quickly. I know this about him so we left in plenty of time. We parked in the blue lot (close to the vendors) and when we got out of the car he was headed straight toward Hank Aaron Boulevard to buy his hat with the money he had earned. The pace in his step was quick and the smile on my face large. I counted 6 vendors as we pulled in the parking lot and I knew this was going to take some time. He wanted to start at the top of the hill and stop at each stand before making his decision. So we did just that. He looked at all the different kinds of hats at all kinds of prices and gets a bit frustrated because the selection for kids is pretty limited. I encourage him that we will find the right hat for him. He was going back and forth between the holiday hats they wear on Memorial Day, the 4th of July, and Labor Day and their more traditional home hat that most recognize. They did not have the holiday hat in adjustable sizes so he moved toward the traditional hat. We completed the first round of shopping and then he wanted to go back to the top and start over. I knew this was coming so I smiled and said “Ok bud, it’s your money.” One of the vendors took a liking to Jackson the first time around and promised to make him a good deal if he came back. The man and I made eye contact, smiled and he winked at me as if to say “I like your son.” So, I wanted Jackson to buy his hat from him but I wasn’t going to force him. We looked at the others again and when we got back to this particular gentleman’s stand he smiled a big smile and said “Welcome back! Do you know what hat you want?” Jackson told him what he was looking for and the man quickly came up with the hat. He had told us in the first visit that this particular hat was $22 and Jackson was prepared to pay him that amount at that moment but decided to look some more. It was a New Era wool blend hat adjustable hat (for those hat lovers out there) and it was worth $22. While Jackson was making up his mind we engaged in conversation with the man and Jackson told him the story of mowing the grass and earning his money to buy a new hat. The man went on and on about how proud he was of him for earning the money and I was so proud to see my little boy becoming a young man as he looked the man in the eye, spoke clearly, and had wonderful dialogue. Jackson was now set and looked up to the man and said “How much?” The man said “$15” and smiled up at me while he said it. Jackson didn’t remember the original price, but I did. I smiled back at him and he said “This kid is my kind of kid. Dad, you are doing a good thing. I watched the two of you walk up and down the sidewalk and you being patient with him. You are teaching your son to spend his money wisely and get a good price for a good product. Dad, you keep on doing what you’re doing and little man you keep on listening to your dad.” We all shook hands and we were on our way to the stadium. What a moment! Jackson and his new hat! I walked toward the stadium with tears in my eyes and a huge smile on my face as I had been taught a lesson when I thought I was teaching the lesson. Jackson taught me a lot about patience that day. He did not want to make an impulse purchase which little kids (and big kids) are prone to do. He was a great steward with his money that day. He knew exactly what he wanted to purchase and he took his time in making his decision. It was one of those moments I knew I would never forget for as long as I live. I don’t know if Jackson will remember it or not, but he certainly taught me a lot about being a steward that day and I think he taught the man who owns the hat stand a thing or two as well. I love baseball. I love my son. PreviousEnd of year giving in the church; do something!